First let me say that I am glad to see older actors getting parts, but... what is the deal with the silly vehicles that are being churned out for them? Since the wonderful performance he turned in for the 2009 Everybody's Fine, De Niro has been cranking out three to five movies a year. He's the biggest offender in a glut of caricatured geriatrics, which has become its own trope as the Fockers, Red / Red 2, et al. developed into franchises. These movies are gratuitous. We just don't need them, and the formulae have been done to death. This time it's Stand Up Guys (Fisher Stevens), a geriatric crime caper with De Niro, along with Alan Arkin, Al Pacino and Christopher Walken, who have also become staples in old geezer round-ups. At least everyone looked like they had fun making Stand Up Guys, unlike The Big Wedding (Justin Zackham) in which De Niro and his fellow aging cast members, including Diane Keaton and Susan Sarandon (demonstrating that actresses are not immune from the lure of these things), exude discomfort with an impossibly inane script. On Christmas day Grudge Match with De Niro and Sylvester Stallone opens, which the previews have convinced me to miss. And now I'm seeing previews for what looks to be a dreadful Christmas release called Last Vegas, in which Michael Douglas and Kevin Kline join De Niro and Freeman in idiocy. Hey, guys -- Bruce Willis, Helen Mirren, Bette Midler, Dustin Hoffman, Barbra Streisand.... You're all millionaires, so it's not like you need the money. I have to assume it's because you like to work that you agree to be in this drivel. Can't someone out there write some good -- and complex -- scripts for these talented people?!!? Second, the British do it so much better. Though it is Dustin Hoffman's directorial debut (and it shows), Quartet (2012) is a decidedly British enterprise that is The Best Exotic Marigold Hotel redux. 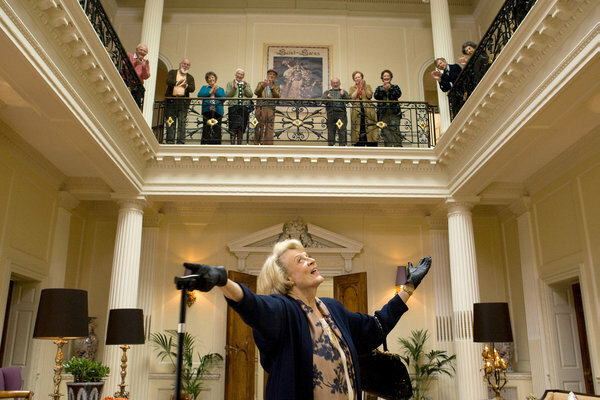 This time the retirement community is not a rundown establishment in India, but an old folks home for retired musicians, and this time rather than on the periphery of the cast the regal Maggie Smith takes center stage as the diva who has reluctantly come there to live -- or reign. As with Marigold the risk of devolving into superficiality is averted by a fine cohort of actors (including Michael Gambon) and by a script that allows of some emotional complexity, unlike some of its American cousins. Written by Ronald Harwood from his play. 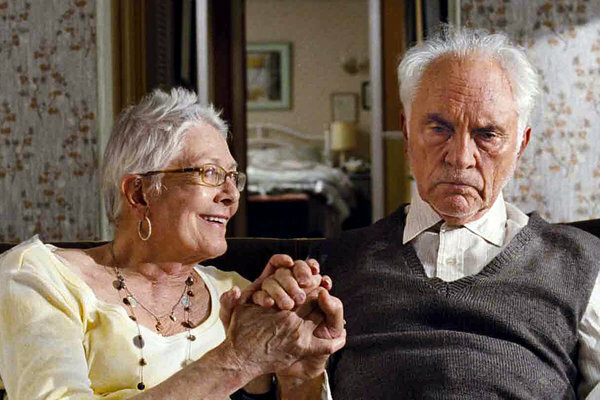 And sometimes the Brits don't do it better as in Unfinished Song, despite two of the greatest British actors of their generation, Vanessa Redgrave and Terence Stamp, in the leads. Marion is just too sweet and Arthur is just too curmudgeonly, and the choir to which Marion is devoted is full of the usual old fogey suspects. And Marion is dying of cancer... Kleenex anyone? Third, just because it's from a European director doesn't mean it will automatically be good. Love Is All You Need is another disappointment. Danish director Susanne Bier's mess of a movie stars Pierce Brosnan as a British produce importer whose late wife was Swedish so his business is headquartered in Sweden. As he drives into airport parking -- he's going to his Italian estate where his son is getting married -- a Swedish woman (Trine Dyrholm) backs into him. Turns out she is going to Italy where her daughter is getting married. Get it? In Italy we are introduced to respective son and daughter, though from our first glimpse, son does not seem comfortable with daughter. Indeed we are beaten over the head with the implication that he is more taken with Kenneth, a member of his wedding party, and when that attraction is finally acknowledged with a kiss, my clueless audience gasped and shouted out in disgust, while I muttered, How could you not have known by now? The movie has the subtlety of a bludgeon, amplified by a soundtrack that blurts out almost every rendition of "That's Amore" ever recorded. Finally, even in this genre it is possible to encounter gems. Nicole Holofcener wrote and directed Enough Said whose characters are not elderly, just middle aged. Along with her sensitive ensemble of actors she has created something rare: a story that is sweet without being saccharine, touching without sinking to emotional manipulation, and made all the more bittersweet by the late James Gandolfini's deeply felt, gently quiet performance. Julia Louis-Dreyfus is Eva, a massage therapist and divorcee fretting about her daughter's imminent move to college. She meets James Gandolfini's Albert at a party and they sort of hit it off. What Albert doesn't know is that his ex-wife (Catherine Keener) is one of Eva's clients, a fact that Eva inadvertently discovers, then exploits, and so, what begins as a comic twist moves toward the semi-tragic and into questions about the ethical nature of our relationships with each other and the consequences of our actions. 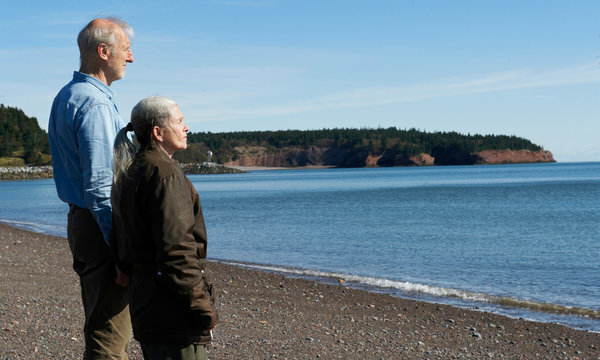 Like Sarah Polley's Away from Her and Michael Haneke's Amour, Michael McGowan's Still Mine takes a sobering look at the realities of dementia and what the reality of true love involves. It is also the true story of Craig Morrison (James Cromwell) who, in trying to build a house that will be safe for his beloved Irene (Geneviève Bujold), encounters all manner of often non-existent building "codes" from a town bureaucracy that throws up one obstruction after another simply because it can. Edward R. Murrow: "Who owns the patent on this vaccine?" Jonas Salk: "Well, the people, I would say. There is no patent. Could you patent the sun?" To move far from my subject, I saw Ramin Bahrani's At Any Price earlier in the year, about a hypocritical Iowa farmer (an outstanding performance by Dennis Quaid) who is at once the local sales rep for a genetically modified seed company while using the last year's harvested seed to save himself a small fortune. I include it in contrast to Still Mine in which government regulation wrongly and punitively harasses an individual. 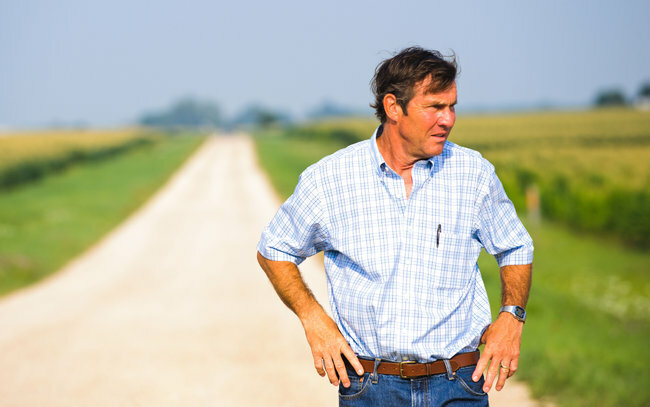 Trying to explain the dilemma agribusiness has created to his son's girlfriend, Henry Whipple blames the seed companies: "They've patented life," he says, and in this he is right. Here is a story in which government protects the harmful practices of big business. As is often true of American cinema, the landscape is itself a character in the film, and the story is an allegory of what has happened to the American ethos through the mirror of a generational narrative, from a proud sacrificing grandfather (Red West who also co-stars in Bahrini's Goodbye Solo), to a cutthroat father, to a son who is hoping to escape the farm and live a life of reckless excitement. Still Mine and At Any Price got me to thinking about how misguided the Tea Party screed against regulation is. Regulation that hobbles common sense endeavors, as in Still Mine, is absurd and should be rooted out. But regulation that protects the public against corporate ecological degradation and financial tyranny is a necessary and desirable state of affairs. That they can't tell the difference is potentially tragic. In the 2013 section titled "The Heist," I discussed Ken Loach's marvelous little movie The Angels' Share, in which the material object of the quest is merely a vehicle for the quest's larger purpose. Like Loach's characters, Alexander Payne's take to the road. This time, however, the quest is set up as futile. Nevertheless, the journey will matter in Nebraska. Bruce Dern gives an remarkable performance as Woody, a taciturn old man who long ago tuned the world out, having given up on any meaningful place for himself in it. His son David knows there is no million dollar prize waiting for his father to claim. Still, he agrees to drive him from Billings, Montana, to Lincoln, Nebraska. Like At Any Price, Nebraska takes a slice of life from a heartland community's decline and dysfunction in the wake of corporate farming. Payne paints a bleak picture of his native Nebraska, and the people who populate it, American grotesques in the tradition of the characters with whom Sherwood Anderson populated Winesburg, Ohio. Will Forte as David does a wonderful job of communicating a range of emotion, while, with the exception of one mild outburst, biting his proverbial tongue. David seizes the opportunity of the journey to come to terms with Woody's life and impending death, and Nebraska asks us to come to terms with the death of an American dream that was really just a myth in the first place.